Appearing as a ghostly apparition in deep space, the LL Pegasi spiral nebula signals the death of a star — and the world’s most powerful radio observatory has delved into its deeper meaning. Left: HST image of LL Pegasi publicized in 2010. Credit: ESA/NASA & R. Sahai. Right: ALMA image of LL Pegasi. Credit: ALMA (ESO/NAOJ/NRAO) / Hyosun Kim et al. When the Hubble Space Telescope revealed the stunning LL Pegasi spiral for the first time, its ghostly appearance captivated the world. Known to be an ancient, massive star, LL Pegasi is dying and shedding huge quantities of gas and dust into space. But this is no ordinary dying star, this is a binary system that is going out in style. The concentric rings in the star system’s nebula are spiraling outwards, like the streams of water being ejected from a lawn sprinkler’s head. On initial inspection of the Hubble observation, it was assumed that the spiral must be caused by the near-circular orbit of two stars, one of which is generating the flood of gas. Judging by the symmetry of the rings, this system must be pointing roughly face-on, from our perspective. Though these assumptions generally hold true, new follow-up observations by the Atacama Large Millimeter/submillimeter Array (ALMA) on the 5,000 meter-high Chajnantor plateau in Chile has added extra depth to the initial Hubble observations. Astronomers have used the incredible power of ALMA to see a pattern in the rings, revealing the complex orbital dynamics at play deep in the center of the spiral. “It is exciting to see such a beautiful spiral-shell pattern in the sky. Our observations have revealed the exquisitely ordered three-dimensional geometry of this spiral-shell pattern, and we have produced a very satisfying theory to account for its details,” said Hyosun Kim, of the Academia Sinica Institute of Astronomy and Astrophysics (ASIAA) in Taiwan and lead researcher of this work. Just as we read tree rings to understand the history of seasonal tree growth and climatic conditions, Kim’s team used the rings of LL Pegasi to learn about the nature of the binary star’s 800 year orbit. One of the key findings was the ALMA imaging of bifurcation in the rings; after comparing with theoretical models, they found that these features are an indicator that the central stars’ orbit is not circular — it’s in fact highly elliptical. ALMA observation of the molecular gas around LL Pegasi. By comparing this gas distribution with theoretical simulations, the team concluded that the bifurcation of the spiral-shell pattern (indicated by a white box) is resulted from a highly elliptical binary system. Credit: ALMA (ESO/NAOJ/NRAO) / Hyosun Kim et al. “While the [Hubble Space Telescope] image shows us the beautiful spiral structure, it is a 2D projection of a 3D shape, which becomes fully revealed in the ALMA data,” added co-author Raghvendra Sahai, of NASA’s Jet Propulsion Laboratory in Pasadena, Calif., in a statement. This research is a showcase of the power of combining observations from different telescopes. Hubble was able to produce a dazzling (2D) picture of the side-on structure of LL Pegasi’s spirals, but ALMA’s precision measurements of gas outflow speed added (3D) depth, helping us “see” an otherwise hidden structure, while revealing the orbital dynamics of two distant stars. A special thanks to Hyosun Kim for sending me the video of the LL Pegasi visualization! The Orion Nebula's star-forming region (NASA). Firstly, apologies that it’s been over a month since last posting to Astroengine.com. Call it slacking off, call it a sabbatical, either way, it’s not good. I’ve actually prepared several half-finished articles, but I just never got around to completing them. However, I have been on writing overdrive over at Discovery News, so if I go quiet over here, you know where to find me. Speaking of Discovery News, I’ve just posted an incredible image of the heart of the Orion Nebula as seen by the Spitzer Space Telescope, so I can’t think of a better way to kick-start Astroengine with an image filled with awesomeness. Although Spitzer has entered a new phase of operations since it depleted the liquid helium coolant used to maintain its instrumentation, that doesn’t mean its stopped producing some awe-inspiring imagery. In a new vista released on Thursday, a bustling star formation region in Orion is detailed, showing some 1,500 young stars the observatory watched for 40 days. This is an unprecedented study, allowing rapid variations in these baby stars to be tracked by Spitzer. Young stars are generally highly variable in their brightness, a characteristic that is of huge interest to astrophysicists. If we can understand the mechanisms causing this variation, we can gain an insight to stellar evolution, possibly even understanding the history of our own Solar System. 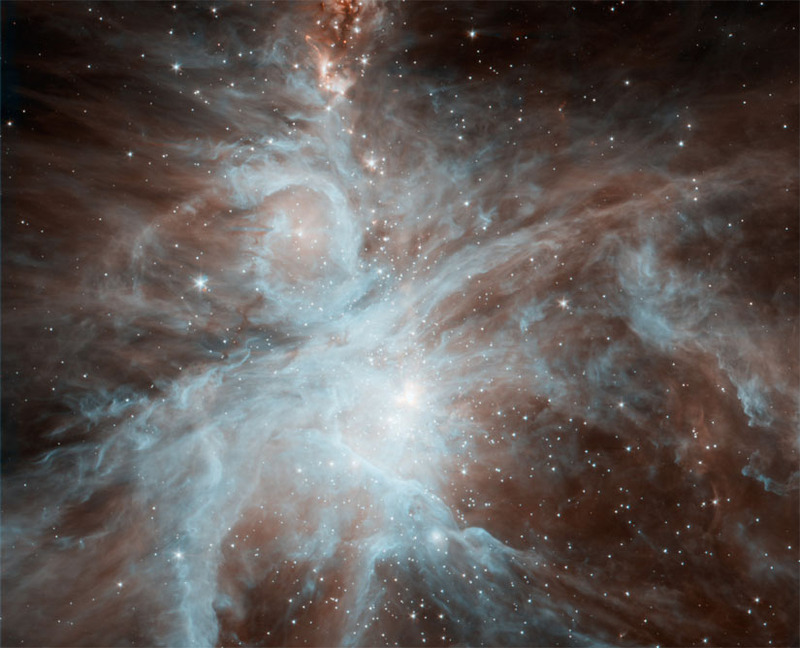 As Spitzer observes in infrared wavelengths, it’s very sensitive to clouds of dust being heated by these young stars. Therefore, the proto-planetary disks surrounding these million year old stars glow brightly. Not only does this give an indication to the conditions surrounding the star, it also provides astronomers with an idea to how these disks of dust clump together, slowly evolving into exoplanets. And now Spitzer has data sets spanning weeks, dynamic changes in the emissions from the stars and their evolving planetary systems can be studied. Dave Mosher, I’m pointing my finger at you for this late night effort! Usually I stay up late to write articles, but for the last 30 minutes I’ve been playing this game after Dave sent a message on Twitter saying he had been playing a “simple” and “addictive” star formation game. No kidding! I shouldn’t have even clicked the link. But like a caffeine-infused moth to a super-shiny flame, off I went for some simple star-creation fun. It looks like the Star Formation game is part of Discover Magazine’s featured article about the mysteries of star birth (it’s a great read, check it out). The game is simple, yet captivating (despite a few minor bugs). You play the role of supernova progenitor, dropping some massive star fury on an unsuspecting nebulous cloud of hydrogen. According to the game developers, the situation is physically accurate, it is just up to you to create the perfect conditions for stars to form in the dense cloud. It would appear the lectures I attended on star formation paid off, as I speak I’m on top of the leaderboard with a whopping 21122 points (see the screengrab above, I saved it posterity, I doubt I’ll be at #1 for much longer). I’m all for games with an educational element, and I can’t think of a better way to spend an evening (well, I can, but if you’re stuck in the office, this is a great alternative to work). I’m off to create some more stars, check out Discover so you can do the same (just you try to knock me from the #1 slot! ).